How to Make Spring Birds of Felt ~ DIY Tutorial Ideas! 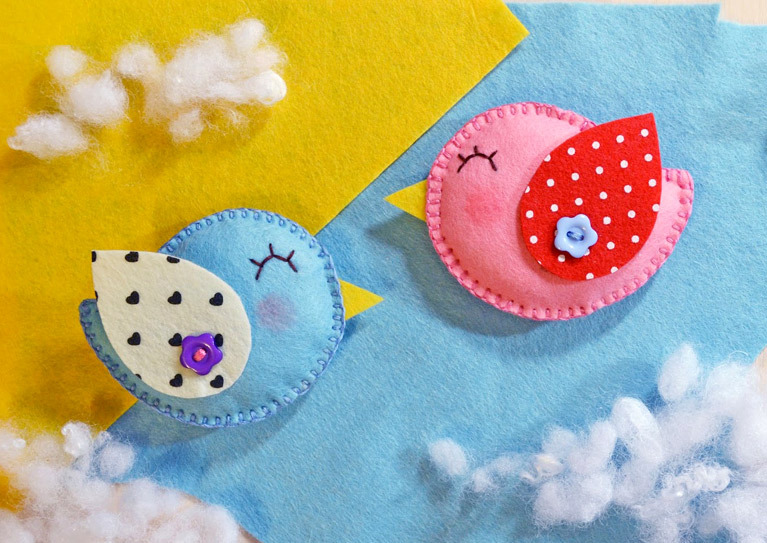 Create spring bird magnets out of felt. I found the pattern on the Net and decorated it for you. Are you ready to create spring mood with your own hands? Then begin! 1. Print the pattern on A4 paper and cut it out. The pattern provides10,5х8 cm bird. 2. Apply the pattern to felt and outline with the pencil. 3. Carefully cut along the contour. Ensure that the pencil contour is not left. 4. Similarly, make wings and beaks. 5. Select beautiful buttons for fastening and decorating the wing. 6. 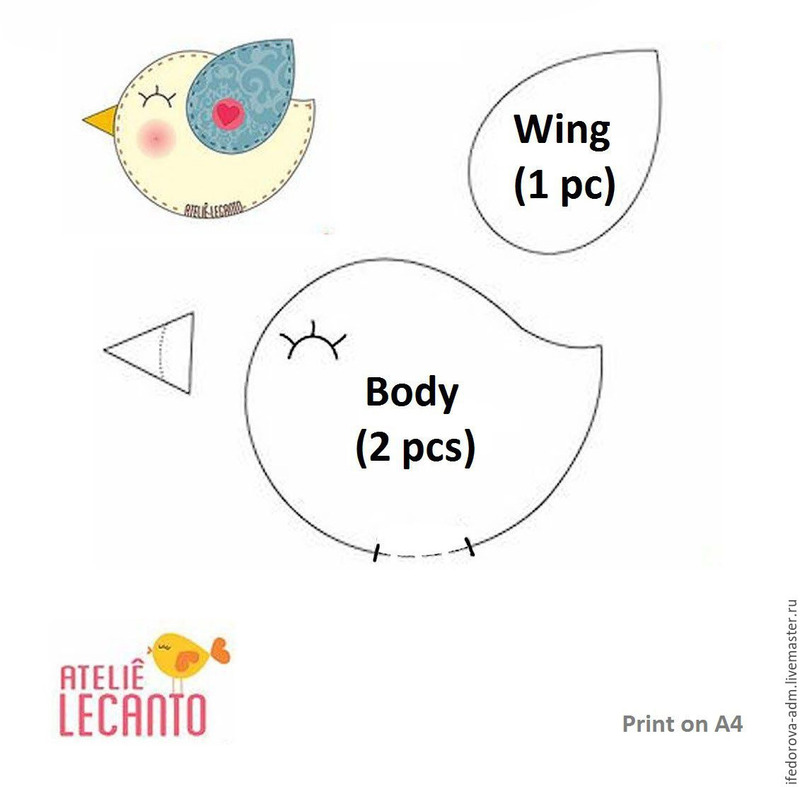 Sew on buttons to the wing and then to the body of the bird (only front part). Three stitches are enough. 7. Draw the eyes and eyelashes with the simple pencil. 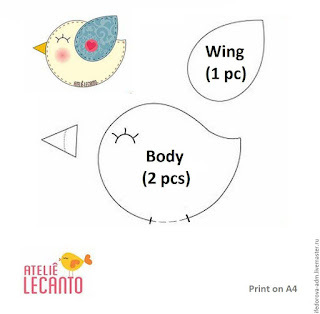 Remember that the perimeter of the bird will be embroidered with a beautiful stitch so do not forget to leave space for it when drawing the eye. 8. Now embroider the eyes using large stitches. 9. It's time to return to the second part of the body and the beak. Overlay the right side of the body to the back and pin. Insert the beak between the parts of the body. 10. Take floss of six threads and begin to embroider the bird contour with a decorative seam hiding the knot between the two parts of the body. When you reached the place where a hole for stuffing should be, do not tie the knot, just leave the thread with a needle. 11. Fill the bird with sintepuh (holofiber). Remember that it will be a magnet, so it should not be too chubby:) So, moderately soft and flat at the same time. 13. Cut out a circle with the diameter of approximately 3 cm from the magnet sheet. Apply glue and press the circle tightly to the back of our bird. The spring felt bird is ready!